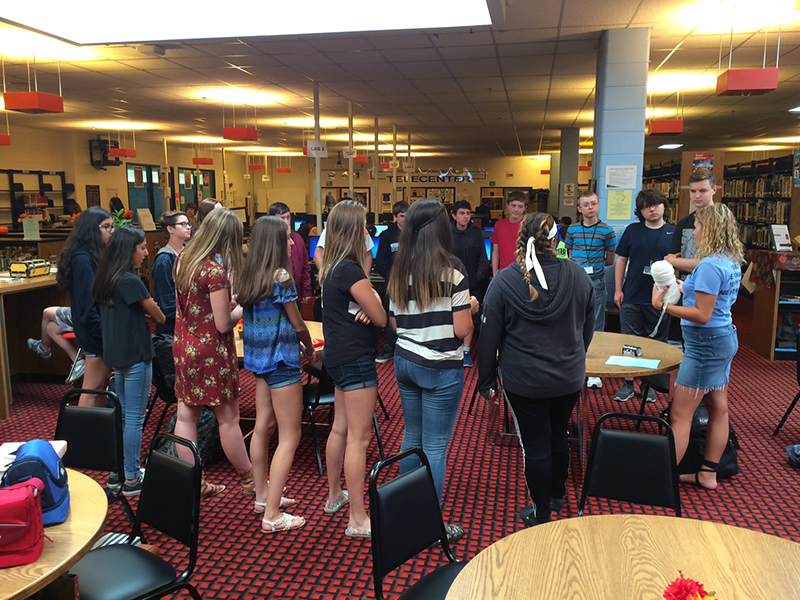 HSE's STEAM Academy students participated in an activity with peer leaders that helped focus them on goal setting. Students in the Arts Academy at HSN worked on a mural that will be displayed in downtown Toms River as part of the district's NEA Big Read. Educators in the HSS Business Academy attended a presentation by local entrepreneurs who founded a new beverage company in Toms River. This is the inaugural year for the three Career Academies in the Toms River Regional Schools and students enrolled in these groundbreaking programs were eager to begin their high school careers on the first day of the 2017-18 school year. The academies are made up of freshmen at each of the district’s three high schools. As eighth graders, students applied to be accepted into the Career Academies and were selected based on certain criteria depending on the academy they were interested in attending. In each academy, students have unique opportunities to concentrate their learning in distinct areas that are of most interest to them and ultimately, provide them with a focused education that prepares them for the challenging world after high school. Each academy offers specialized courses that will provide them with authentic learning experiences in many different career areas. These academies are aligned with the district’s continued dedication to and focus on college and career readiness for its graduates. The STEAM Academy is located at High School East and offers students the opportunity to focus more in the areas of BioMedicine, Engineering, and Environmental Sustainability. Course content within these three strands of the academy include marine science, medicine, engineering, science research, genetics, advanced manufacturing, and more. 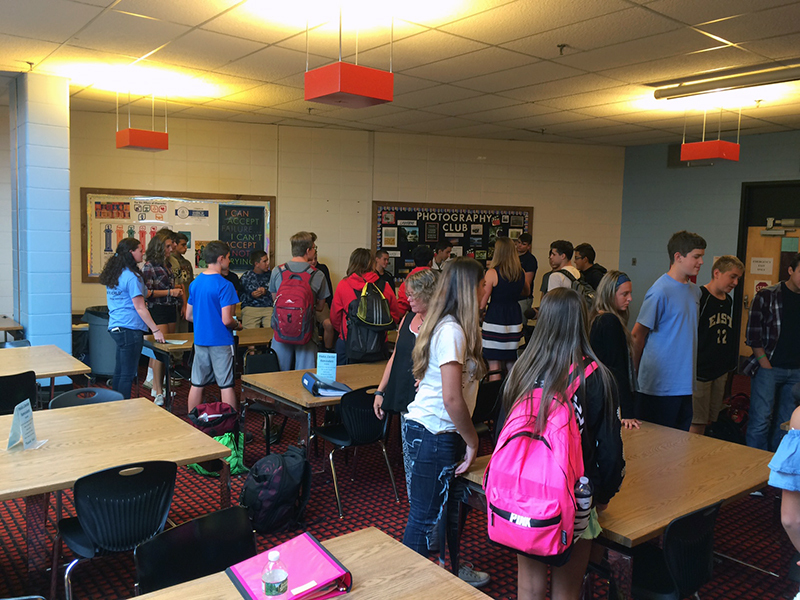 As students entered the hallways at East on the first day, they were introduced to their unique STEAM Academy schedule. Teachers and students in the program are scheduled into math/science and humanities blocks to allow for more flexibility and academy students will have a weekly biology lab. As they familiarized themselves with the school and their new teachers, several curricular resources were introduced to them including "Hidden Figures: The American Dream and the Untold Story of the Black Women Mathematicians Who Helped Win the Space Race" by Margot Lee Shetterly; "Guns, Germs, and Steel: The Fates of Human Societies" by Jared Diamond; and as part of the district’s NEA Big Read initiative, "Station Eleven" by Emily St. John Mandel. These works will serve as centerpieces for cross-curricular, capstone projects unique to the career academy students. Throughout the year, students will meet regularly during their lunch period for a “lunch academy” where peer leaders will guide them through different activities to help provide support in areas such as goal setting. There are several opportunities for students in the STEAM Academy that are still in the planning stage but will have a major impact on their high school studies. Thanks to a partnership and grant award from The Hirair and Anna Hovnanian Foundation, an Anatomy and Physiology Lab will be created at the school and will anchor the biomedical strand at this particular academy. The grant will support a state-of-the-art lab with anatomy models, appropriate technology, digital and physical resources, and science-oriented furniture, to be used by all students in the School of Biomedicine as well as others studying the biological sciences. Later this month, students in the Environmental Sustainability School will partner with the Poseidon Academy on two field trips to Cattus Island County Park and Brown’s Wood Recreation Area & Estuary. Throughout the school year, the academy will host professional guest lecturers from local engineering firms, hospitals, and environmental agencies. These industry professionals will provide insight on their respective fields to academy students. The principal of the STEAM Academy, Mr. Kevin McCann, reported that administrators and teachers are actively working on creating new electives for these students such as Introduction to Atmospheric Science; Honors Engineering, Drawing, and Design; Forensics; and Genetics. STEAM Academy teachers also participated in extensive training last spring and summer on the creation of authentic learning units through the LATIC (Learner-Active, Technology-Infused Classrooms) teaching model. Up the road at High School North, students in the Arts Academy are focusing their studies in the three areas of fine arts, digital arts, and performing arts. These strands are further broken down into the specialized areas of vocal, visual arts, theater, digital, and dance. Vocal students at the school are currently working in the brand new, state-of-the-art piano lab. The design of the lab allows the students to work independently on 8 pianos and keyboards while the teacher can provide immediate feedback through the use of headsets. This type of collaboration between the instructor and the students provides individualized attention to their work and is also a great example of the Learner-Active Technology-Infused (LATI) teaching style being embraced in classrooms throughout the district. Students in the Visual Arts School have partnered with the Toms River Business Improvement District (BID) to design and create a mural as part of the district’s NEA Big Read initiative. The mural is scheduled to be revealed during Downtown Toms River’s Harvest Arts Festival on October 21st. 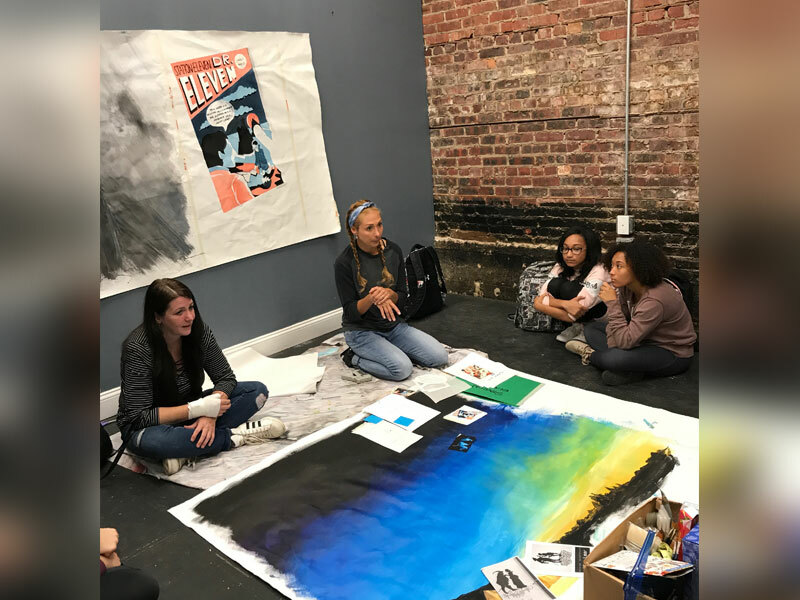 These visual arts students will also enjoy visits throughout the school year from professional artists and are looking forward to taking class trips to local art exhibits. To start the school year, students in the theater group are learning about the fundamentals of theater by performing in small groups and then presenting to their peers. As the year progresses, their performance venues will grow in size and culminate on the big stage. Already, HSN theater academy students performed the introduction to their fall play, “Stronger Than the Storm,” at the NEA Big Read Kickoff event on October 2nd at the Ocean County Library. Prior to that sneak preview, two theater students, Yna Tresvalles and Luke Sulsenti, read live passages from "Station Eleven"—the novel on which Toms River’s Big Read is based—for the attending crowd of parents, fellow students, teachers, administrators, residents, and community leaders. The district’s third academy is located in downtown Toms River at High School South. Students at South are enrolled in the Business Academy and are following rigorous course sequences that will provide them with the knowledge to obtain a certificate upon graduation in one of the following three areas: finance, real estate, or entrepreneurship. As freshmen students in the Business Academy this year, they are enjoying academy specific courses such as Accounting I Honors, Principles of Law, and Marketing I Honors. Funding from The Hirair and Anna Hovnanian Foundation has been secured to design and implement a Real Estate Incubator, which will be the centerpiece of the Real Estate Academy at the school. The goal of the Incubator is to offer students a direct career path in real estate and offer them real-world knowledge in the areas of real estate ethics, listing services, the nature of markets, licenses, mortgages, marketing, and contracting fields. The Incubator will remain true to the district’s integrated learning philosophy, and will blend market science with tech, engineering, art, and math. Administrators, teachers, and community partners, such as local universities, the Chamber of Commerce, and entrepreneurs, are currently working on its design and implementation. As part of a professional development offering, South’s academy educators welcomed the co-founders of Cottonmouth Iced Tea, a small beverage company in Toms River. The entrepreneurs shared their startup story, offered strategies and tips on how to start a small business, and talked about their marketing campaign. 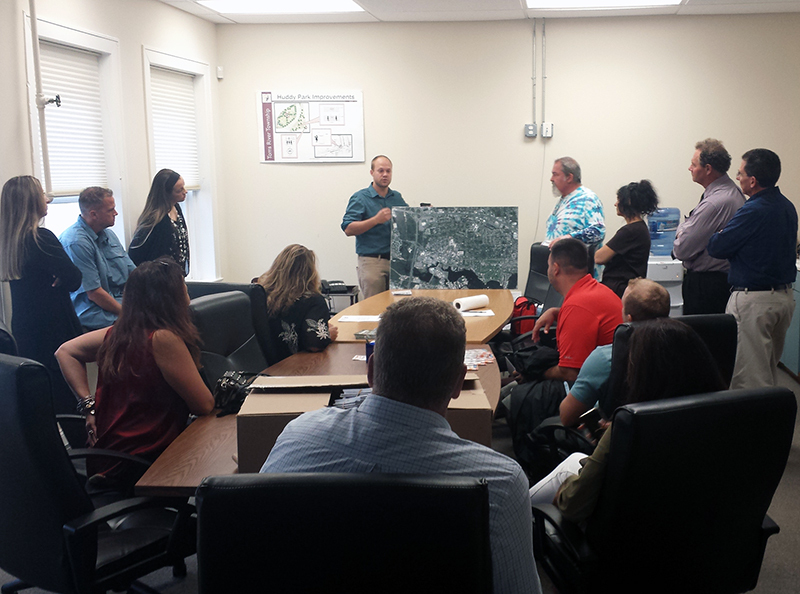 Additionally, the teachers visited the Business Improvement District (BID) in downtown Toms River where they gathered information on the local businesses and saw firsthand how these businesses operate day-to-day. The goal of this professional development is to share it with the academy students and ultimately have the students visit the businesses later in the school year and collaborate on projects. In the classroom, students are already applying newly learned concepts to real life situations. For instance, after studying about market segmentation in the Marketing Honors class, students were randomly assigned an age group and asked to research the group to figure out their spending patterns, education, income levels, among other categories. All of these categories factor into how companies market their products to target specific groups of people. 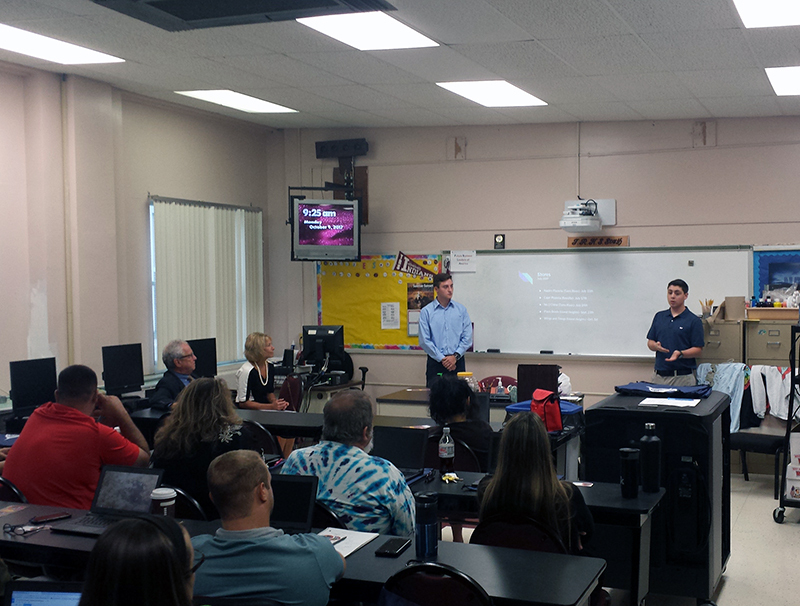 The students were asked to present their findings to their classmates. This is just one example of the many projects that students and teachers are collaborating on each day within the academies. The district is excited about the implementation and opening of these Career Academies and looks forward to continued growth within the individual academies. Ultimately, the district hopes to open all three academies at each high school so that even more of its students can take advantage of the specialized curriculum and hands-on learning experiences. STEAM Academy students at East were introduced to their new schedule and had the opportunity to meet with representatives from different clubs and sports teams on the first day of school. 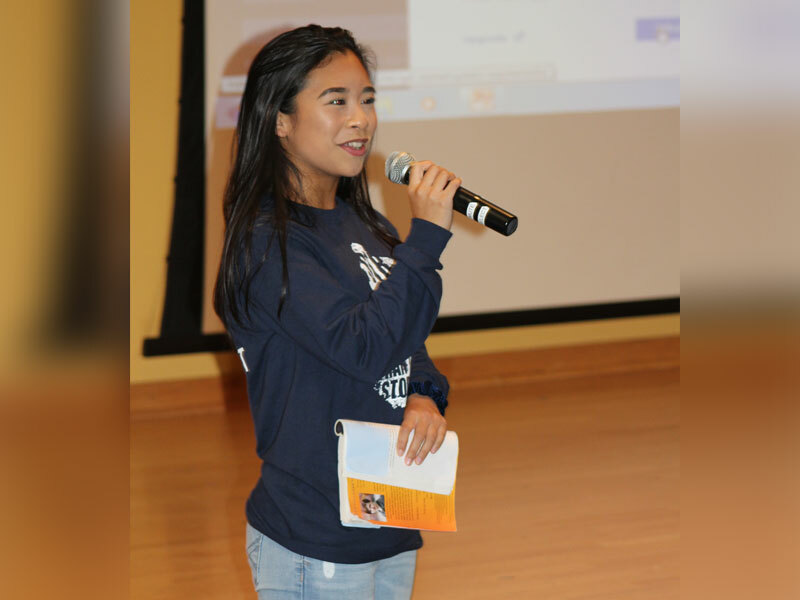 Yna Tresvalles, Arts Academy student at HSN, performed a dramatic reading of passages from "Station Eleven" at the NEA Big Read kickoff event. Nick Zorojew, director of the Business Improvement District (BID) in downtown Toms River, presented to HSS's Business Academy staff regarding the role of his office and its future plans for businesses in Toms River.